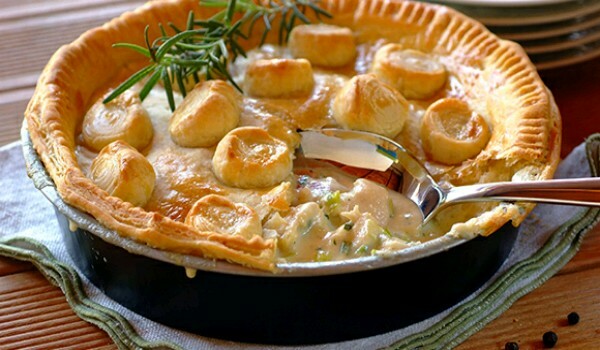 Creamy Chicken Pie is a very popular recipe. Learn how to make/prepare Creamy Chicken Pie by following this easy recipe. Lightly butter a pie dish. Heat butter in a pan and fry bacon rashers, green onions, and garlic, stirring continuously until bacon turns crusty. Add flour and stir until well blended. Remove from heat. Pour milk slowly, stirring constantly, until thickened. Leave aside to cool. Fold in chicken, cheese, and eggs. Cover with a wet cloth and set aside. Lightly grease two pastry sheets and fold each sheet half end to end. Place them in the pie dish diagonally overhanging the ends. Repeat the same placing 6 more sheets clockwise in the dish, until the dish is enclosed. Lay dollops of the chicken mixture on the sheet and wrap up the mixture with the overhanging ends. Finally, grease the last two sheets and wrap semi width ways over the mixture. Add on the remaining chicken mixture and remove the ends. Grease with some more butter. Set the oven to 180 °C and bake for 35 minutes, or until brown.